Welcome to the website for the 2006 World Championships! The 2006 Championship has been quite an event - over 300 matches spanning 6 categories, twelve days of competition. And what a competition - the finals saw some spectacular matches, notably the nailbiter in the Ladies Elite between Canada and Australia. So, here's the 2006 World Champions in the all of the categories - click on the link to view the team profiles. For full details of all the medal winners and the final standings, have a look at the tournament results. Also, the whole results section has been updated to make it easier to see the results for both stages of the competition (round 1 matches and finals results). Photo gallery - now online! Recall all of the excitement of the championships by looking at the photo gallery. There are over 400 photographs, including underwater photographs during the tournament, as well as shots from the opening and closing ceremonies, players welcome reception and final party. You can also order copies from this site, courtesy of JAlbum and Photobox! Miss any of the matches? Don't worry - you can still watch the replays of all the competition matches with 247.tv! 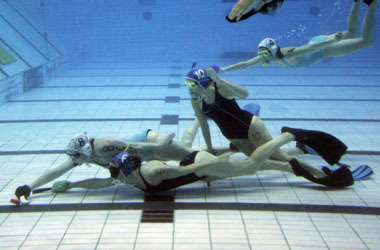 On behalf of the CMAS Underwater Hockey Commission I welcome you to the 2006 World Championships web site. In 2006, these championships were the largest single underwater hockey event ever staged and we had 17 countries competing. It was great to see underwater hockey return to its birthplace and be celebrated by so many people from all over the world. Underwater hockey prides itself on the reuniting of old friends and the creation of new friendships for the future. As always the competition has been played in the true spirit of fair play and respect for all involved as this is the unwritten code of underwater hockey. This web site has been designed in the 3 official languages of CMAS and contains all the information you will need about this tournament. Please enjoy the site and we look forward to seeing you at future events.